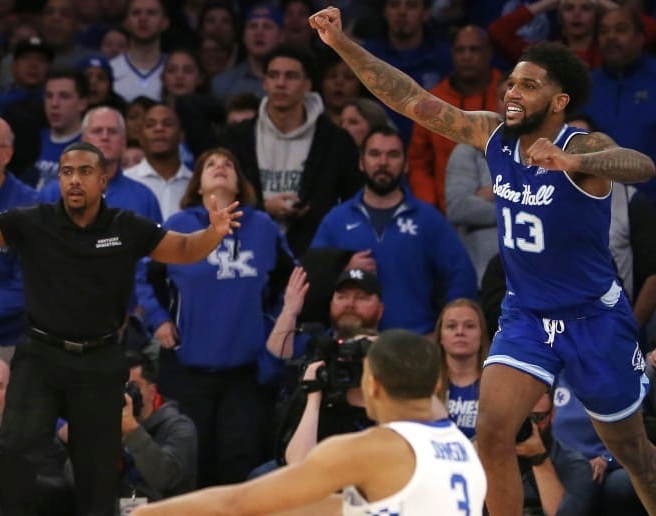 It’s been 3 decades since the Wildcats and the Pirates have last met, and now Kentucky and Seton hall meet under the NYC lights as they play at Madison Square Garden in the City Hoops Classic. This game would prove as a test for both the shaky Wildcats, who were blown out by Duke in their opening game but have gone on to win 7 straight, and the inconsistent Seton Hall Pirates. Many projected Kentucky would be able to run away with an easy win but the Pirates would look to cause an upset. Both Kentucky and Seton were off to a sloppy start. While Kentucky’s defense seemed to have improved, their offense was extremely lackluster. Through the turnovers and the missed shots in the paint, they found themselves up 3 (19-16) as Reid Travis hits and an 1 shot inside after 10 mins without a field goal. Immanuel Quickley came alive, scoring a 3 point jumper to give the Wildcats a 6 point lead to close the first half. As the 2nd half was underway Seton Hall battled back as they tied the game 39-39 with 13 minutes left on the clock, followed by back to back shots by the Pirates to give them a 4 point lead (43-39), but Coach Cal’s Wildcats refused to give up. PJ Washington would show great presence down low with key boards and put back shots as he led the Wildcats with 20 points with 4 mins left in regulation. Both teams fought to the wire as the game was tied 67-67 with 39.4 on the clock. But Myles Powell would drain a step back 3 to give Seton Hall a 3 point lead; but it doesn’t end there. Keldon Johnson would respond with a circus shot 3 to send the game into overtime. Overtime was nothing short of electrifying as both teams made shots that sent the crowd in an uproar. As the Wildcats took a 1 point lead, the Seton Hall Pirates decided that they would make this day an upset indeed ; they defeated the Wildcats 84-83 in true Garden showdown fashion.